(2017/New West) - Vinyl LP pressing includes digital download. The Deslondes are a five-piece band from New Orleans. 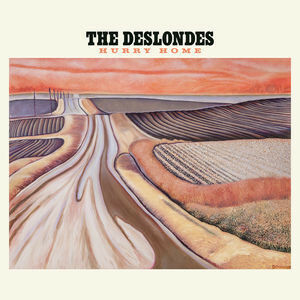 In the time between the release of their self-titled debut and new sophomore album, Hurry Home, The Deslondes have toured the world and drawn critical acclaim for their studied and inventive take on New Orleans country and R&B. Hurry Home represents a sonic shift from the countryfolk of their debut to a sometimes-psychedelic, electrified gospel-soul sound, with a stronger emphasis on organ and electric guitar. The band split up songwriting and lead vocal duties among it's five members, continuing it's democratic ethos and musical versatility. The sound may continue to draw comparisons to the country-funkiness of The Band, but The Deslondes were equally inspired by the sound of early Sun Records, the punchy rock and roll of VU-era Velvet Underground and the experimental pop of Joe Meek. Perhaps most importantly, Hurry Home is the sound of a band that understands the history of American music, but is deftly finding their own contemporary approach. Évaluations de clients pour "Hurry Home (LP)"